STAMFORD, CT – Harman International (NYSE:HAR), the premium global audio and infotainment group, announced today that its Lexicon® brand has won a Technical GRAMMY® Award, which is presented to individuals and companies that have made contributions of outstanding technical significance to the recording field. The National Academy of Recording Arts and Sciences announced their Special Merit Awards earlier today. Recipients are determined by vote of The Academy's Producers & Engineers Wing Advisory Council and Chapter Committees, as well as The Academy's Trustees. 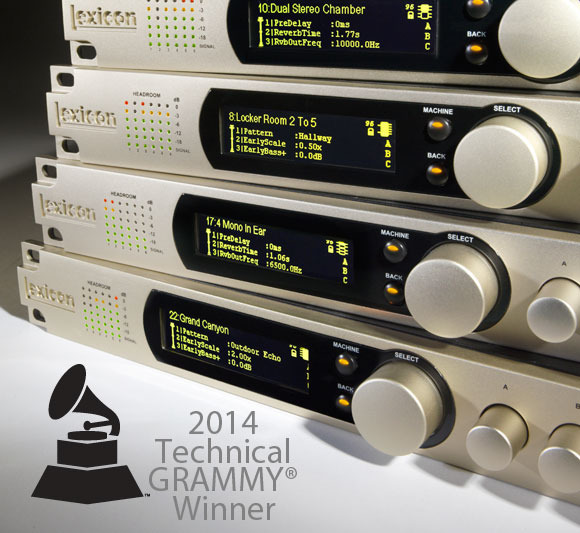 This year’s Technical GRAMMY Award recognizes Lexicon’s contributions to the art and science of music recording and reproduction through innovation and excellence in product design. The Lexicon brand is in rare company: the only other such award is being presented posthumously to Emile Berliner, who invented and patented the “Gramophone” sound recording device in 1887. Founded in 1971, Lexicon is one of the world's premier manufacturers of digital effects processing electronics and home theater systems. The company was among the first to produce commercially-available digital reverb systems which is used by 80 percent of recording artists, and was also an early pioneer in the hard disk recording sector. Lexicon also markets premium amplifiers for luxury cars, home theater and distributed audio applications, featuring the brand’s exclusive Logic 7® surround sound processing algorithm.